FGI’s business model was built around our clients: they are at the heart of everything we do. By reducing the complexity of immigration for our clients, we are able to process cases faster, achieve outstanding approval ratings and deliver our services at greater value than other immigration providers. 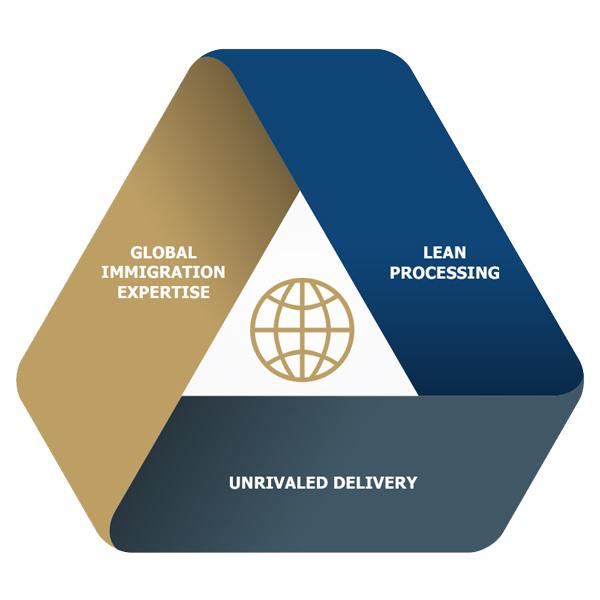 Our business model is unique in that we relentlessly focus on three key areas: immigration expertise, lean processing, and an unrivaled delivery model that leverages a single point of contact. Our business model has been successful and our clients validate it regularly. At FGI, we focus on what matters most to our clients. FGI’s business model is founded and supported by an outstanding team of immigration professionals. Each member is well-trained and equipped to deal with the ever-changing and complex world of global immigration. For additional subject matter expertise and to accommodate local jurisdictional requirements, FGI has established a world class alliance partnership with attorneys and consultants in over 100 countries. These professionals are well-known for their expertise in immigration and oftentimes, have published numerous immigration articles or presented at immigration and business conferences. Our FGI staff, along with our alliance partners, work seamlessly to execute the immigration process, at a local level. Passionate focus and scrutiny, that encourages lean processing, sets FGI apart from others in the global immigration industry. FGI applies the fundamentals of Six Sigma and ISO to the architecture and design of all processes, documentation, and technology utilized within the global immigration practice. FGI’s team provides a unrivaled level of service that takes the confusion out of immigration and boils it down to a simple, easy to understand, list of steps and actions. FGI’s delivery is second to none. Our firm delivers outstanding approval ratings worldwide. This is the heart and soul of the professional service we offer. Our clients oftentimes tell us that our service is white-gloved and the customer experience exceptional. We take extreme pride in this. To simplify the delivery of our services and foster this white glove experience, we offer clients a single point of contact at FGI. Clients are not expected to speak to multiple resources in different countries throughout the day or evening. FGI handles that for you. This approach simplifies the experience for our HR contacts and assignees, improves client satisfaction and reduces turnaround times.